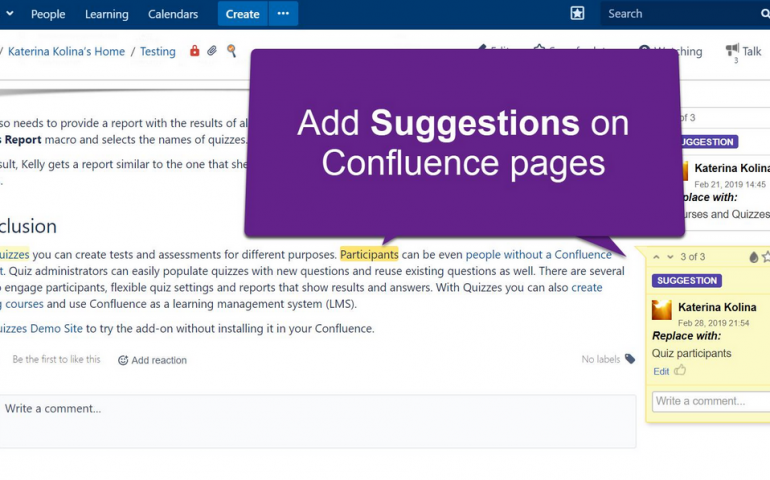 All Confluence users have a great way to document their ideas about any page or blog post with the help of page comments and inline comments. Commenting helps them contribute to each other’s content. Users can review what’s written on the page and comment any piece of text and then discuss all the details in a comment thread. To further empower teams that work on pages together, we came up with a new handy feature for the Talk app. Please, welcome Suggestions in Confluence. You just need to select the text you suggest to change, click and enter your suggestion text. The initial content will remain on the page and your suggestion will be displayed on a sidebar. 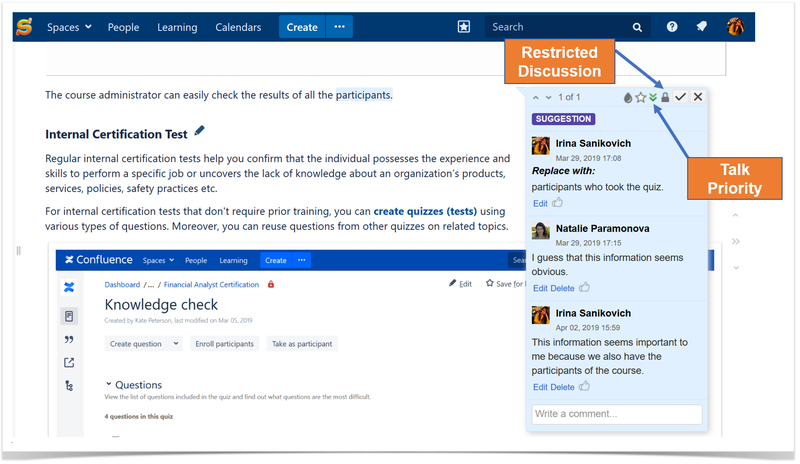 If you need to explain your point of view or want to check what other users think about your idea, you can easily discuss your suggestion – add a comment in your suggestion and mention people you want to include in the conversation. This will help the author understand why you think this change should be made and allow other stakeholders to chip in as well.. Moreover, you can use all the capabilities of the Talk app: set view permissions, priorities, use different colors, and build reports to track all suggestions in any space. When you suggest something, the owner of the page gets a notification and can decide whether to accept your ideas or not. If a suggestion is accepted, changes apply automatically. In case a user rejects the suggestion, it disappears. However, it can still be found in the page history. Check out the capabilities of Talk – Advanced Inline Comments and enjoy team collaboration in Confluence. You can discuss and review the content your colleagues share with you suggesting edits on the fly. 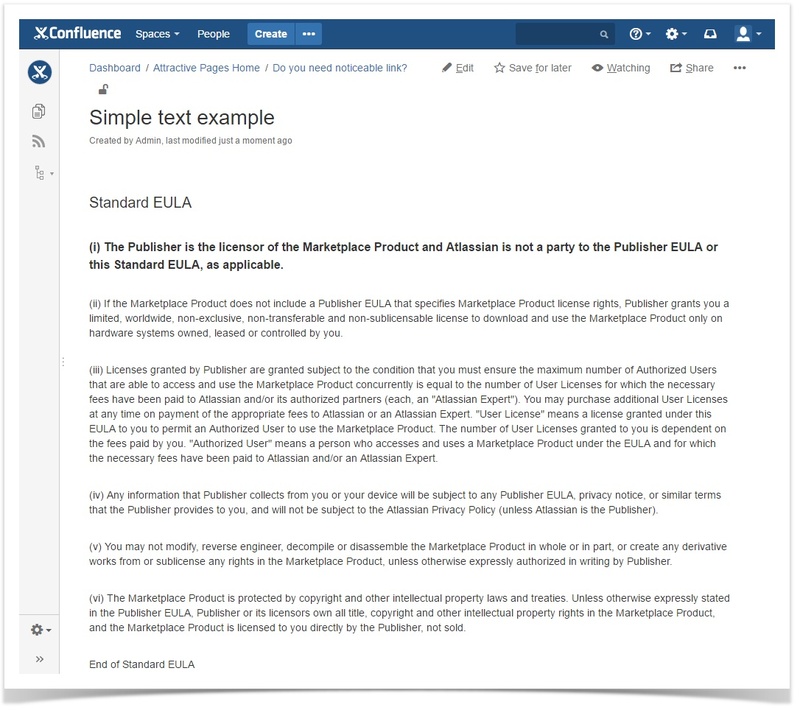 This way you can easily edit and correct any piece of text in Confluence both when editing or viewing the page content. Talk – Advanced Inline Comments can be an alternative solution to the native inline comments in Confluence. You can take the Talk vs Native Inline Comments quiz to learn the difference between these two tools and choose the one that suits you best. If you have any questions, feel free add your comments and suggestions to this blog post.